The resulting beverage stabilizers, Ticaloid® PRO 192 AGD and Ticaloid PRO 192 AGD High Viscosity, address these needs while still meeting label parameters. One common quality defect that can severely reduce a protein drink’s shelf-life is the tendency of the protein to form an irreversible gel over time. Product developers were challenged to provide sufficient suspension of the dairy protein and extend the shelf-life of the beverage without the formation of protein gels. Some beverage manufacturers report a maximum shelf-life of only three months with traditional stabilizers while our extended shelf-life testing of beverages made with Ticaloid PRO 192 AGD continue to remain stable with no signs of age gelation after 6½ months. According to data from Innova, relative product launches of dairy beverages with protein claims increased from 2014 to 2016 and launches of beverages with protein levels above 10 g doubled during that period. While shelf-stable protein beverages are popular with consumers, it can be difficult to suspend higher levels of protein for an extended period of time. With the superior suspension capabilities of Ticaloid PRO 192 AGD stabilizers, product developers can overcome obstacles that previously limited innovation. Another area of growth in the dairy beverage category is the desire to add or increase the levels of nutritional oils in a formulation. From 2014 to 2016, Innova reported a 300% increase in relative new product launches of dairy beverages with protein claims and fat levels ranging from 2.1-4.0 g.
The emulsifying capabilities of traditional stabilizers limited the loading levels and types of nutritional oils that could be used in new beverage formulations. With Ticaloid PRO 192 AGD stabilizers, manufacturers can explore formulation options that weren’t possible in the past, including those with higher oil loads or made with difficult to emulsify nutritional oils. Lecithin replacement—Soy lecithin has traditionally been used as an emulsifier in RTD dairy beverages but it is prohibited by some labeling standards. In some cases, soy lecithin can be replaced with sunflower lecithin but its availability is limited. Ticaloid PRO 192 AGD and AGD High Viscosity rely on Gum Acacia for emulsification. Sugar reduction—Unlike other RTD beverage stabilizers, Ticaloid PRO 192 AGD and AGD High Viscosity are not standardized with sugar. Non-GMO/All-Natural—Both Ticaloid PRO 192 AGD stabilizers meet our internal definitions for Non-GMO1 and All-Natural2. Existing beverage stabilizers left manufacturers susceptible to quality issues due to usage level fluctuations and inaccuracies. When using such highly functional ingredients, weighing errors of just hundredths of a percent could result in finished products that are either over- or under-stabilized. 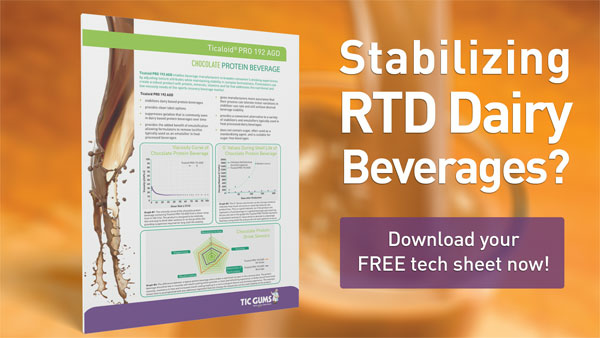 Ticaloid PRO 192 AGD and Ticaloid PRO 192 AGD High Viscosity give RTD beverage manufacturers more assurance that their process can tolerate minor variations in stabilizer use-rate and still achieve the desired beverage stability and texture. A successful new beverage not only needs to meet the quality and label expectations of consumers, but it must also create a pleasant drinking experience. Texture profiles of dairy protein beverages range from refreshing sports recovery drinks to more indulgent meal replacement shakes. Once these attributes were identified, our Gum Gurus developed the Ticaloid PRO 192 AGD stabilizer systems that addressed those attributes responsible for creating the desired specific texture profile. The significant texture differences between a typical protein beverage and a shake is apparent in this sensory data. The protein beverage should be low in viscosity and mouth coating which provides a clean and refreshing experience. A shake should have more viscosity, resistance to flow and increased mouth coating, leading to a more indulgent texture and drinking experience.